Bull Temple in Bangalore at the southern end of Bull Temple Road, Basvangudi. This is one of the oldest temple in the city and it is built by Kempe Gowda in 1537 A.D. during the Vijaynagar period. The temple is at the top of Bungle Hill. The temple has an impressive tower that is decorated with sculptures on all the sides. This attraction at this temple is the colossal image of bull. it is 5 meters in height and 6 meters in its length. The monolithic bull out of the granite stone is much older than the temple itself. Originally colour of the bull was grey and gradually, it turned black as devotees applied coconut oil to it. 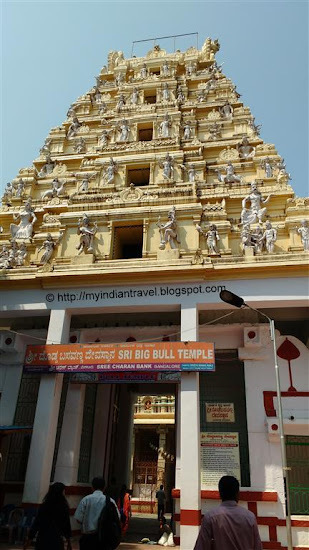 It is believed that the temple was constructed to pacify a bull, who went on rampage in a ground nut field. It is also thought that the statue size increases further and as per the advise of Lord Shiva, to prevent the bull from growing further a trident was placed on the forehead of the bull. 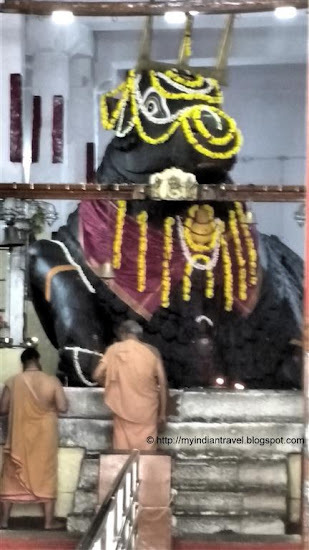 In this temple the Bulls the principle deity and behind this gigantic Nandi, there is a Shiva lingam. Interesting bull statue with a trident on head! We checked a similar bull (in size) at the foothills of Nandi Hills and it was enclosed in a small room and places along the floor rather sat on a platform. Impressive tower so rich decorated;also , impressive statue of bull! Interesting place! Fine shots of this beautiful temple. Such beautiful ornate carvings, and that bull is amazing. What an unusual sculpture of a bull to find inside this temple! The bull indeed looks huge, wish people had refrained from spoiling its beauty! Fascinating and such fine workmanship. I love your interesting photos, but can't click to enlarge them. I wanted to get a look at the lingam cuz I've never seen one. So that must be how Basavangudi got it's name, right? Thank you for sharing the legend. And it must be near here that the groundnut festival happens...? Nambiar, you are right. It is the place where ground nut festival does happen. What a nice temple, beautiful images! Interesting pictures. Thanks for this virtual tour. It feels great to know about this temple ☺☺ very interesting!